Daily anti-malware scans are performed on SoftMouse.NET in order to detect for the presence of malicious code and to monitor potential malicious activity. GeoTrust (a Symantec company) provides SoftMouse.NET anti-malware monitoring. Please look for and click the GeoTrust anti-malware monitoring badge on our website (See Image 1 for badge illustration). When the badge is clicked, a page will open listing the website URL that is being monitored as well as the date of the most recent anti-malware scan. Daily anti-malware scan for regular check-ups to assure our visitors that site has been scanned for malware. The malware scan includes analysis of web page for identifiable malicious code plus monitoring to identify malicious activity to enable easy clean-up if the site is infected. Instant alerts identifying malicious code to enable fast malware removal. On-demand scans to enable quick confirmation of clean site status. Malware scan also protects SoftMouse.NET web site traffic by avoiding blacklisting by browsers and search engines. 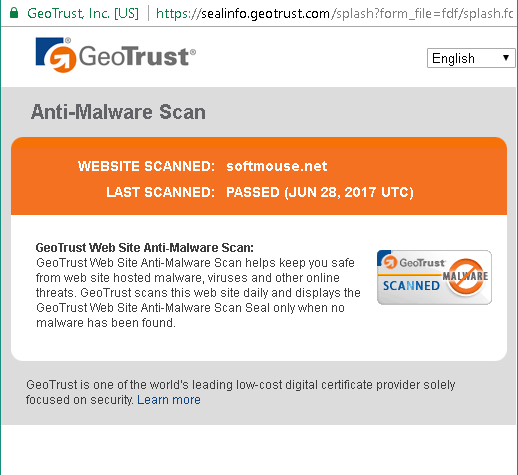 Geotrust anti-malware seal is placed at the bottom of each SoftMouse.NET web page to assure site visitors that the site is clean of malware.